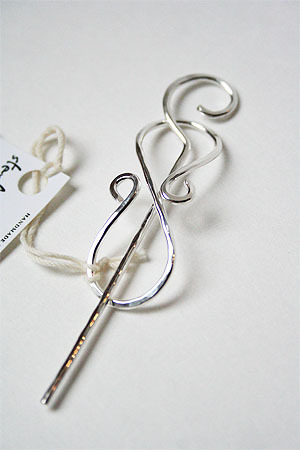 Lovely in sterling and as light as a feather, this hammered shawl pin is a simple and elegant adornment for your most delicate handwork, but is sturdy enough for heavier knits as well, with no sharp edges to snag or pull. Body of pin is approx. 2 in. in length. Pins are hand formed and will vary slightly in appearance.